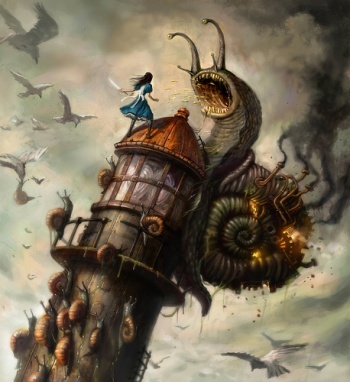 Remember that creepy stop-motion trailer for the sequel to American McGee's Alice that we saw earlier this week? Turns out it wasn't real. In case you missed the slightly unsettling trailer from Monday, here it is. You may notice that in said news post, I questioned why American McGee had called the movie "unofficial," since the professional production values - and the fact that it was being featured on the game's official site - looked pretty darn official to me. Yesterday, a few sites picked up a video of Alice made by one of our fans and confused it as an official trailer of Alice 2. I wanted to clear up any confusion - as I mentioned in my post it was unofficial, and does not represent any of the final art direction or story elements in Alice 2. We look forward to sharing information on the game in the future. The reason the "fan-made" trailer looked so damn professional, though, was because ... it was. According to the website of its creator Troy Morgan, the video was developed as an "advertising pitch" to EA and American McGee, which meant that even if it wasn't official, something very much like it could be. So there you have it, folks. The mystery of the official-looking "unofficial" trailer has been solved.